The Brant Goose (Branta bernicla), a goose of the genus Branta, is known in North America as Brant, Brent Goose or Black Brant. The spelling "Brant" is the original one, with "Brent" being a later folk-etymological idea that it was derived from a classical Greek waterbird name brenthos. It is in fact onomatopoeic, derived from the guttural call note of the species. For the origin of the scientific name bernicla, see Barnacle Goose. The Brant Goose is a small goose, about 60 cm long and with a short, stubby bill. The under-tail is pure white, and the tail black and very short (the shortest of any goose). Some DNA evidence suggests that these forms are genetically distinct; while a split into three separate species has been proposed, it is not widely accepted, with other evidence upholding their maintenance as a single species. The body of the dark-bellied form is fairly uniformly dark grey-brown all over, the flanks and belly not significantly paler than the back. The head and neck are black, with a small white patch on either side of the neck. It breeds on the Arctic coasts of central and western Siberia and winters in western Europe, with over half the population in southern England, the rest between northern Germany and northern France. The Pale-bellied Brant Goose appears blackish-brown and light grey in colour. The body is different shades of grey-brown all over, the flanks and belly are significantly paler than the back and present a marked contrast. The head and neck are black, with a small white patch on either side of the neck. It breeds in Franz Josef Land, Svalbard, Greenland and northeastern Canada, wintering in Denmark, northeast England, Strangford Lough in Northern Ireland and the Atlantic coast of the U.S. from Maine to Georgia. 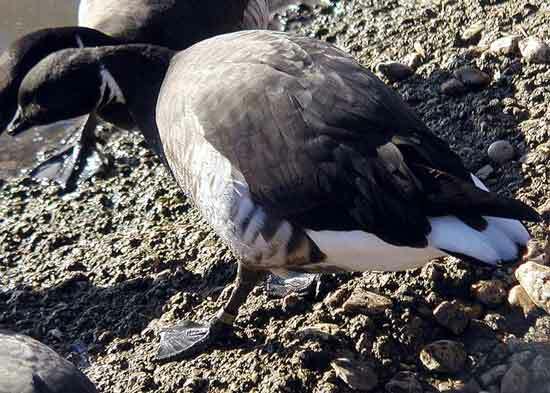 The Black Brant appears blackish-brown and white in colour. This form is a very contrastingly black and white bird, with a uniformly dark sooty-brown back, similarly-coloured underparts (with the dark colour extending furthest back of the three forms) and a prominent white flank patch; it also has larger white neck patches, forming a near-complete collar. It breeds in northwestern Canada, Alaska and eastern Siberia, and wintering mostly on the west coast of North America from southern Alaska to California, but also some in east Asia, mainly Japan. The Asian populations of the Black Brant populations had previous been regarded as a separate subspecies orientalis based on purported paler upperparts coloration; however, it is generally now believed that this is not correct. A fourth form (known variously as Gray Brant, Intermediate Brant or Grey-bellied Brant Goose) has been proposed, although no formal subspecies description has been made as yet, for a population of birds breeding in central Arctic Canada (mainly Melville Island), and wintering in the Puget Sound on the American west coast around the U.S./Canada border. These birds are intermediate in appearance between Black Brant and Pale-bellied Brant, having brown upperparts and grey underparts which give less of a contrast with the white flank patch. Given that this population exhibits mixed characters, it has also been proposed that, rather than being a separate subspecies, it is actually a result of interbreeding between these two forms. It used to be a strictly coastal bird in winter, seldom leaving tidal estuaries, where it feeds on eel-grass (Zostera marina) and the seaweed, sea lettuce (Ulva). In recent decades, it has started using agricultural land a short distance inland, feeding extensively on grass and winter-sown cereals. This may be behaviour learnt by following other species of geese. Food resource pressure may also be important in forcing this change, as the world population has risen over tenfold to 400,000-500,000 by the mid 1980s, possibly reaching the carrying capacity of the estuaries. In the breeding season, it uses low-lying wet coastal tundra for both breeding and feeding. The nest is bowl-shaped, lined with grass and down, in an elevated location, often in a small pond. The Brant Goose is one of the species to which the Agreement on the Conservation of African-Eurasian Migratory Waterbirds (AEWA) applies. * Shields, G. F. (1990). Analysis of mitochondrial DNA of Pacific Black Brant. The Auk 107: 620-623. * Syroechkovski, E. E., Zöckler, C. & Lappo, E. (1998). Status of Brent Goose in northwestern Yakutia, East Siberia. Brit. Birds 91: 565-572.